Authorities say a 1 year old boy died Sunday afternoon after running into the street and getting hit by a car. People who may have known the toddler, dragged the woman, Mirlande Mardice, 53, of Deerfield Beach, from her car, and started to beat her up. The Broward Sheriff's Office says the boy, Neallie Junior Saxon III, was outside playing with other children near NW Fourth Place in Deerfield beach, when he got hit. A witness told deputies that the children often played outside without any adult supervision. On Sunday, deputies said Saxon ran into the street to chase a ball when a woman who was driving eastbound on the road, within the speed limit, hit the child with her SUV. Deputies say the other kids were were running in and out of the street during the incident and may have distracted the driver. 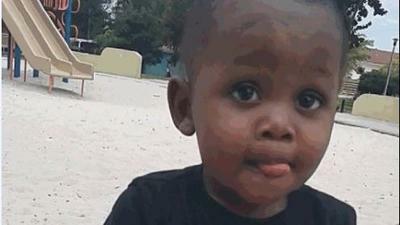 Investigators say Saxon was shorter than the car's bumper, and the driver wouldn't have been able to see him. To make matters worse, after the accident, the woman did not know she hit little Saxon and continued driving until she came to a stop sign. That's when deputies say, several unknown people dragged her from her car and began to beat her. “She would have left. She had no intentions of stopping,” Neallie’s grandmother, Caroline Chery said. Neighbor Jannette Martin said she saw the aftermath of the beating. When police arrived, the driver, bleeding from a deep gash near her eye, told them, “It’s me, it’s me” who was to blame, Martin said. People were hysterical, the child’s aunt passed out in the street, she said. The woman was taken to a local hospital for injuries that included several fractures to her face and head. Neallie died at Broward Health Medical Center in Fort Lauderdale. After an autopsy Monday, the Broward County Medical Examiner’s Office found that his death was accidental, from multiple blunt force injuries. Little Saxon would have been two in December. Deputies are investigating the battery along with the boy's death.